Flashings are essential for the tight connection of roof windows with roofing materials. Precisely designed flashing details ensure a durable and neat fit with the roofing material used. The purpose of flashing is to ensure good drainage away from the window and to provide protection from the elements. Flashings can be used with all types of the centre-pivot windows (FT, PT), with raised axis of rotation (FYP, FDY), the top-hung windows (FPP, PPP, FEP), as well as (FT_/D, B__). These types can be in combinations. Thanks to the new line of profiles different types of windows can be placed together. As there are many roofing materials available, FAKRO offers a range of flashing solutions. All flashings are manufactured using aluminium as standard, permanently protected with polyester varnish. The standard colour is brown RAL 7022, which matches well with most roofing finishes. 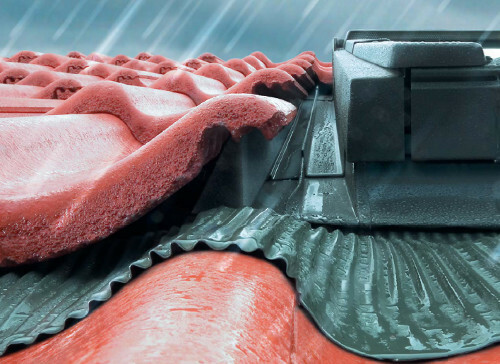 FAKRO roof window flashings are categorised according to roof material and application. Standard flashings are intended for the most common types of roof covering; flat-Flashing ES, profiled-Flashing EZ, and for roof surfaces with a high profile- Flashing EH, slate-Flashing EL, plain tiles – EPV. Flashings are categorised accordingly. The last third letter of the flashing type code indicates the depth at which the roof window can be fitted. Specific flashings are available for less common roof coverings, e.g. some flat roofing materials-Flashing EL & EG, and flat sheet metal roofs-flashing EE. There are also flashings for specialist applications, such as flashing EHV-AT with additional insulation, and flashing EA for window installation at a different angle to that of the main roof. For installation of roof windows at a pitch below 15° the EFW Flat Roof System should be used.